People are often at me to illustrate what I mean when I talk about "dilution" in karate/martial arts so I thought I'd do so by reference to the common chudan uke or chest deflection. I have chosen chudan uke because I think it provides one of the starkest examples of how a technique can be passed down from generation to generation with the same macro movement - but with all the essential details missing. In this article I will be referencing a particular karateka of a particular school (see below) not because I wish to denigrate either, but because I am respectfully diametrically opposed to how they do their chudan uke - and their video clearly highlights our differences in approach. I'm sure that the student is an excellent all-round karateka and fighter and that the school is reputable, however in respect of their chudan uke we have a technical disagreement. I will outline why I feel I am "right" and why their performance of chudan uke (which is probably the most common variation of this technique in karate today) constitutes a dilution of functional knowledge. First let me examine the performance of the chudan uke in the video above. The version of chudan uke is what I call the "shorin" version (ie. predominantly used in the Shuri and Tomari te traditions as opposed to the Naha te traditions such as goju ryu and uechi ryu). You will note from the adjacent images that this performance of the block begins by swinging the blocking arm to one side with the palm up. I have italicized palm up because I think this is quite critical - as you will see later. While this is happening the other arm is being loaded for a pull back. In this regard you will see that it is thrust forward almost as a punch. Again, the use of this "supporting" arm is quite critical and I will address this issue in due course. Finally the arm is then swung sideways in a smashing action - an issue that I feel highlights the major difference between how I feel the chudan uke should not be performed. Both the start and finish positions are the same: the forearm is vertical, elbow well away from the body and in line with the shoulder. Again this is something I feel is critical and I will address it shortly. The angle in the elbow crease at the start and finish appears to be correct: 90 degrees. As I have mentioned there are 2 main variations of chudan uke and I will proceed to describe how they should be performed. Ultimately elements of both can and should be combined in applying an effective deflection against an attack. Indeed many kata (eg. seipai from goju ryu) contain movements which combine both basic versions of chudan uke. I'll start with the Naha te version because I feel that it is actually easier to explain. It is the classic "wax on / wax off" movement unfairly lampooned since the Karate Kid movies but utilising a closed fist instead of an open hand (the arc inscribed by the circular movement is identical in both closed fist and open hand versions). The technique begins by shooting your primary blocking/deflecting hand outward and upward at an angle of about 45 degrees both horizontally and vertically (as if you had a platter on your chest at a 45 degree angle and you were rubbing the platter with the back of your forearm). As with the version demonstrated at the start of this article, the primary hand is palm up (ie. big knuckles down). However the most critical difference is that the arm does not swing sideways: it goes out to intercept the attack. At the moment it reaches the attack it does so at an angle allowing the attack to be "wedged" or "slipped". As the deflection starts to "wedge" the attack, you further aid the redirection of the attack by continuing a circular movement at the 45 degree angle - inscribing the circle at the before-mentioned 45 degree angle. As you can see from the images to the right, the attack is intercepted and deflected. Despite my frequent use of the term "block" (which I do out of habit - see for example my article "Why blocks DO work") the technique does not "block" or "stop" the attack; rather it uses the power of the circle to "slip" the attack. At no point are you "smashing" the attack away either. In fact, the less "impact" you can make while still deflecting the attack, the better. You don't want to use force against force. You want to use efficient technique. You will note from the above images that your secondary arm doesn't stay idle either. As I have discussed at length in my article "Two for the price of one: more about karate 'blocks'", the secondary arm inscribes its own circle, acting as a backup block - or perhaps even the primary one, leaving the lead hand to be used in attack. As with the Naha te version, the "shorin" chudan uke utilizes a circle to deflect the attack. However the circle utilized in the shorin version is the rotation of the forearm (from palm down to palm up) rather than an arc inscribed by the forearm moving out to intercept the attack. As you will note from the pictures on the left, the use of this kind of deflection is dependent partly on having your arm out to one side (although that is scarcely an issue: most basic movements rely on your arms being in a particular position - if they are not, you must opt for another, more contextual response). You will note that unlike the version at the start of this article, the primary arm starts out palm down - not palm up. 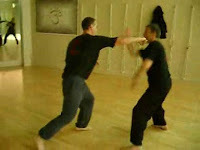 It is the turn of the forearm that "wedges" or deflects the attack. Without it, you simply do not have a deflection - you have a brute force smash. What is so wrong with the first version? The version of chudan uke at the start of this article (the "diluted version") is problematic in that it misses many of the details I have referred to above. First, in order to achieve a smash your arm has to load - meaning that you have to swing it to one side in order to effect the smash. I recall as a young martial arts teacher being confronted with this issue when a rank beginner asked me: "What stops me from just hitting you as your arm goes to the side?" Of course it only occurred to me later that night that the chudan uke we predominantly use effects an interception - it doesn't swing to the side. But the student never came back, so I never got to answer his question. Of course, as I've stated above, all deflections are "contextual" and it is true that the shorin variation requires your arm to be in a particular position for it to work. But this is different from requiring a "swing" to create momentum for a smash. Which brings me to my second point: even if you can smash an attack out of the way, why would you? This use of brute force is a most inefficient (and painful) way of dealing with an attack. I know some people argue that their system relies on "attacking" their opponents limbs, using blocks as "strikes", however I have yet to see anyone using the diluted chudan uke in sparring. On the other hand I use at least a portion of the chudan uke deflection in every sparring session and have for almost 3 decades of training. It is important to remember that the 2 versions of chudan uke are basics: they teach you principles of deflection and the correct angles of attack. In sparring you apply the principles you've learned from these basics - or a portion of those basics (given that they are "complete" movements of which you might only need to rely on a particular part). The picture to the above left shows me using the "secondary portion" of the chudan uke in recent sparring (again see my article "Two for the price of one: more about karate 'blocks'"). The first, diluted version of chudan uke ignores this "secondary" aspect of the chudan uke. The diluted version also leaves out more subtle details in the start and finish which, as I have discussed in my article "The karate 'kamae' or guard", create a "Clayton's gap" - ie. the appearance of a gap for a jab on your leading side which in fact isn't there at all. This "Clayton's gap" is the basis of the old bareknuckle guard of old and requires your forearm to be angled so that your elbow is closer to the body. However in the diluted version there is no "Clayton's gap" - there is a real one. The diluted version has almost certainly been passed down from instructor to student over many, many years. However when one passes down form without understanding its function there are bound to be copy errors. Over time these errors are magnified and compounded, resulting in the dilution that is now common. Why has this dilution occurred? I believe it is almost certainly due to the lack of bunkai practised in karate once it left Okinawa. Gichin Funakoshi and others stressed the practise of basics in large groups of students, playing down the application of those basics. Instead of applying basic technique, karate schools began to focus on sports fighting - developing the unique "ippon shobu" sparring (somewhat unfairly derided as "tag" sparring by some) that requires a small subset of techniques from karate. Blocks/deflections are rarely needed in this form of sparring. Students doggedly continued practising their basics in the air, but sparred using the ippon shobu sports method. Nor did they practise drills or other bunkai which rely upon correct details in blocks/deflections. Slowly the copy errors began to creep in. One by one essential details were forgotten or reinterpreted until only the "macro" movement remained with none of the details that are essential to the application of the basic in real combat. Today I see this dilution all around me - so I suppose it's no wonder that some combat sports fighters scoff at deflections/blocks. I have had some people write to me saying "I did a year of x or a year of y and that was enough to prove to me that blocks don't work". I have typically replied: "Yes, but what kind of school was this?" Their response tends to be along the lines of: "You're such an elitist who thinks he knows everything - what makes you think your school knows how to do things properly?" My answer to this logic: in the above examples you can see how a deflection can't possibly work and my examples show how a deflection should work in a logical framework. I'm not "elitist" - I've just studied martial arts for 30 years, and I've done so with a critical eye. I haven't just accepted the things I've seen from different teachers. Rather, I have made up my own mind based on sorting the wheat from the chaff using logic and practical experience and by cross-referencing karate with the Chinese martial arts. Even well-intentioned teachers can perpetuate dilutions (and goodness knows, I've been one of those at various times in relation to various techniques). With respect to the chudan uke, it is my view that unless you've been practising it with the above details in mind, you haven't really understood the essence of its function. Great analysis of Chudan Uke here. I believe developing the subtleties of slipping and deflecting are one of the great pleasures of martial arts training. A properly angled and executed 'block' does much to upset the balance and positioning of the opponent. Another thing that this kind of training can lead to is the use of kyusho vital point striking as the attack comes in. The sliding and angling of good chudan uke sets up striking series perfectly.